The Pandeiro is a small drum made of a rounded wooded frame, six pairs of metal discs along the sides, and an animal skin or a nylon head. 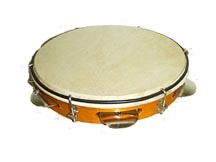 The Pandeiro is used in a number of Brazilian music forms, such as Samba, Choro, Coco, and Capoeira. The Brazilian Pandeiro derives from the Pandeireta or Pandereta of Spain and Portugal which is a square double skinned frame drum, often with a bell inside. The South American Pandeiro is a modern descendant of it. In the Capoeira the Pandeiro is second to the Berimbau in terms of dominance and importance. Mestre Bimba used to play with one Berimbau and two Pandeiros.